Dr. Ward is a 4th generation optometrist who completed her undergraduate studies at Miami University of Ohio and West Virginia University (Go Mountaineers!). Upon graduating Southern College of Optometry, Memphis Tennessee, in 1988 she began her career in Orlando after meeting her husband Tom Ward. 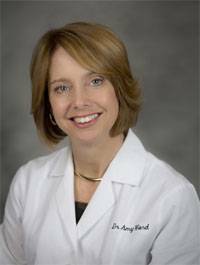 Dr. Ward expanded her optometric education by becoming a Fellow of the American Academy of Optometry in 2006. This level of proficiency is attained by only 10% of optometrists in the United States. She has also served as President of the Central Florida Society of Optometric Physicians and is a long standing member of the Florida Optometric Association and the American Optometric Association. Her mission is to help patients see better and understand how to continue healthy vision throughout their life. Adding Scleral contact lens fitting, nutrition education and dry eye specialty makes her a practitioner interested in answering difficult visual situations. There is nothing more satisfying than delivering the gift of vision! When she isn’t in the office she most likely will be enjoying the outdoors. You can always start a compelling conversation about cooking, cycling, rowing or what her two daughters, Kaitlyn & Jennifer, are up to.